No game room is complete without the perfect couch to lounge on. Which style of sofa best matches your game room’s rad personality? The game room is where everyone comes together to enjoy a round of air hockey, a friendly ping-pong tournament, and movies and popcorn. The game room is also where everyone comes to relax and veg out! Aside from game room accessories like dart boards and an entertainment system, every game room needs a comfortable sofa. A comfy piece of furniture to sink into is necessary when immersed in a “Call of Duty” battle with friends. The key to turning a game room into a cozy space for the whole family is the couch because it anchors the space in both comfort and style. Browse the styles below to garner some inspiration for the perfect game room sofa. But beware: Once you deck out you family game room, you won’t be able to keep the neighborhood kids out of your house! 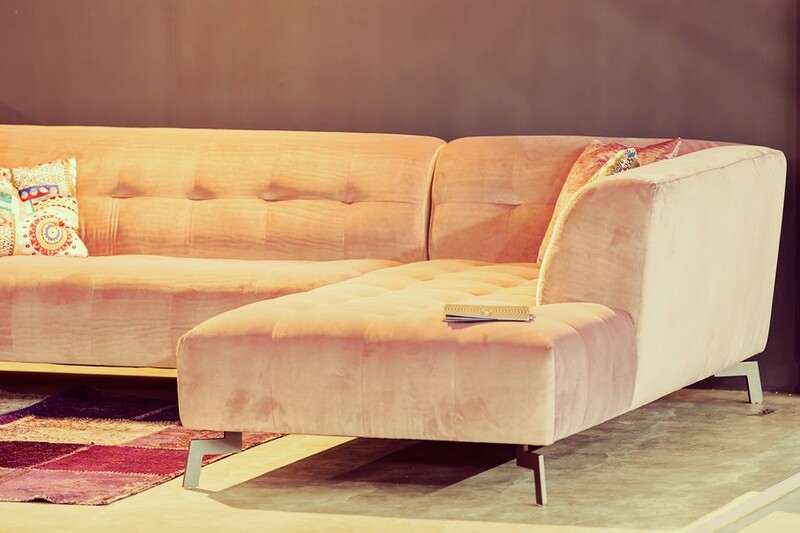 You can never go wrong with a classic sofa. And an option like the one below, which includes a chaise for full-body lounging or sleep, is such a great option for the family game room. Speaking of naps, any sofa with a sleeping function is a great and very versatile solution for any interior. But in the game room, a sleeper sofa provides extra comfort and a place for the kids to host slumber parties on birthdays and special occasions. Whether there’s a chaise extension of the couch itself or a full pullout bed, it provides a comfortable place to stay while also saving space by combining a necessary piece of furniture with a convenient guest bed. And even if you don’t have a spare guest bedroom, you know your guests staying in the game room are getting hooked up with a great sleeping option and awesome entertainment. One of the awesome aspects of the family game room is that it allows the decorator more creative freedom. Unlike the dining room or formal living room, where furniture may be a bit more traditional and uniform, the game room is a place for creativity. To follow along with the playful attitude of the game room, why not include a “playful” sofa? The round sofa like the one above is perfect for propping in front of a TV with videogames. Can’t you just picture you and the family lounging together on the couch, controllers in hound, and a bowl of chips being passed around? Looking for small game room furniture? 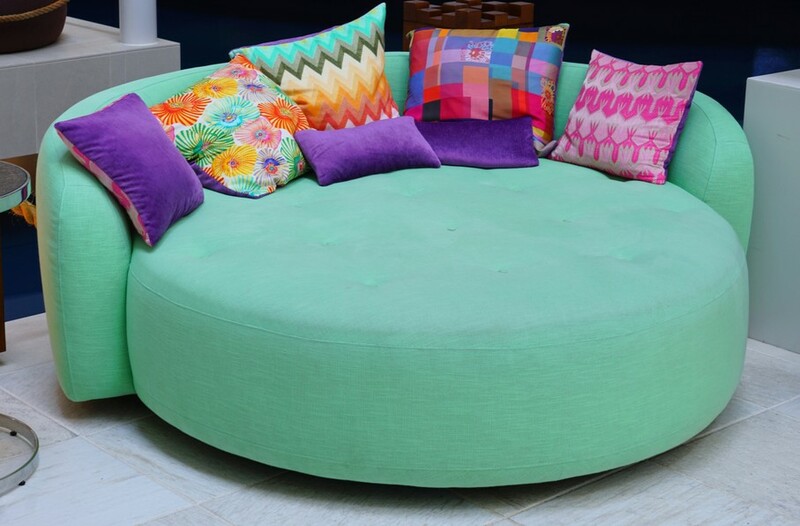 How about replacing the traditional sofa with a few bean bag chairs? Or a single giant one? Whatever floats your boat! In the game room especially, a traditional sofa may cause aches and pains after sitting for a period of time because of its stiffness. Swap it out for a bean bag, and you’ll be in lounge-town heaven! There’s nothing else quite like them. The “beans” cradle every inch of your body, making bean bag chairs an ideal solution to avoid cramps during playing extended video game sessions. Even better, extra-large bean bags are available up to 7.5 feet wide, so they offer plenty of room for a few people on one bag, or room for you and your dogs! Looking to decorate with a more modern or updated look? When searching for a game room sofa, opt for a pop of color, texture, or modern style. The sectional below adds rosy hues that match the purple walls, and this sofa brings loads of personality into the space. The subtle chrome frame also adds to the modern and edgy feel, rounding out the design of the sofa itself. When it comes to sofa shapes, a sectional like this one is a perfect because it maximizes the available space and provides extra seating for guests. In the game room, it also seats everyone around the television or coffee table, which makes it ideal for board games. If you’re decorating more of an adult-inspired game room or urbane man cave of sorts, consider investing in a leather couch. 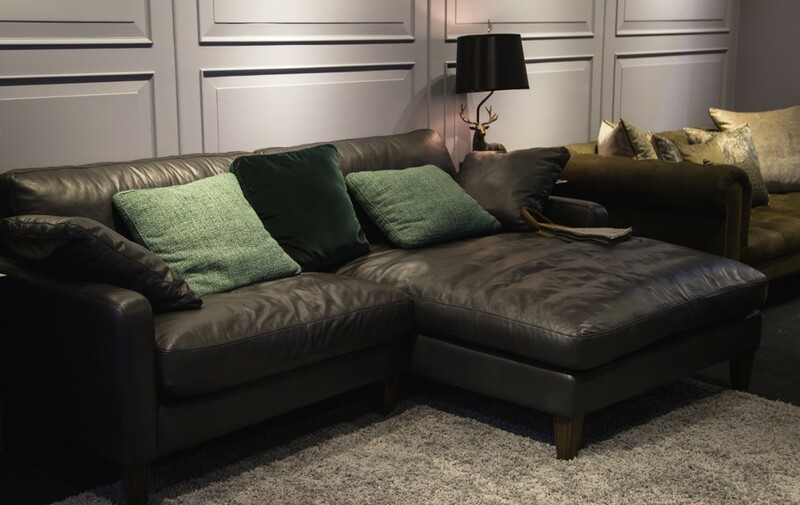 The texture and classic design of leather will bring an extra level of sophistication to your space, while remaining casual enough to maintain the feel of a game room. If you’re really going for a classic look to match your vintage pool table and juke box, opt for black of brown or black leather with a simple yet comfortable look. 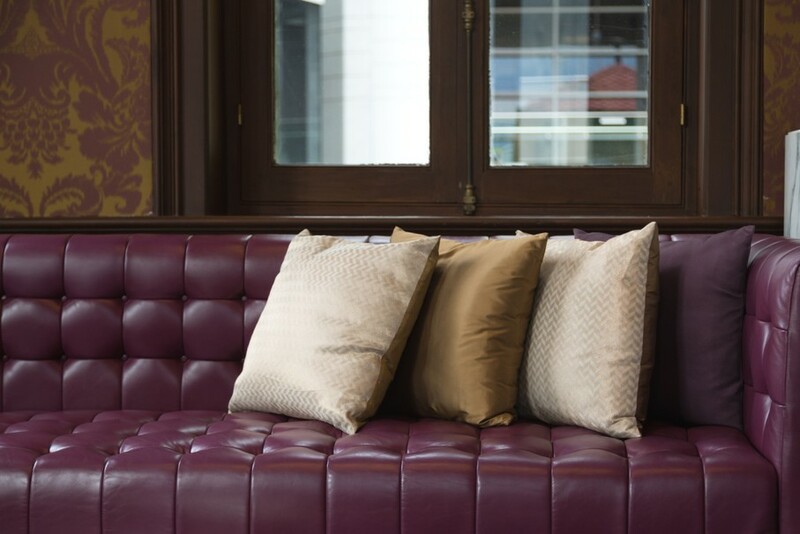 If you want to inject a little more swankiness into the space, opt for a deep burgundy color like you see in the bolstered couch above. The main point of a game room is to provide a space where you can have fun, relax, and enjoy time with your friends and family. But then again, no one wants a game room where they have to stand around all day! Your game room seating is essential to the functionality of the room. And with all the game room sofa options and styles available on the market, we know you’ll find a seat to comfortably beat everyone at “Monopoly” from in no time!